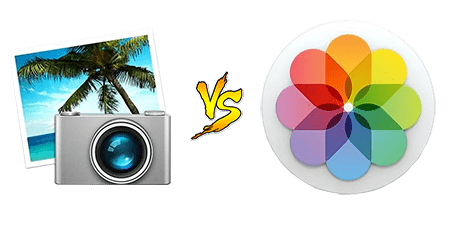 iPhoto vs Photos: Update from iPhoto to Photos or Not? What kind of file takes up the most space on your iPhone or iPad? Photo might be the answer we hear most. Yet, if your iPhone photos become more and more, eventually you will find they're so messy and space-consuming. To solve these problems, you need to organize your photos and transfer photos from iPhone to Mac via your Mac free app iPhoto or Photos. Well, here comes another problem: which one is better to use, iPhoto or Photos? should you update to Photos? Don't rush to answer these questions before you read on the below comparison between iPhoto and Photos. MacX MediaTrans when it comes to bulk transfer iPhone photos to Mac. Intel QSV hardware accelerated speed to bulk transfer iPhone images to Mac. 30 Seconds to finish 1000 4K photos transfer; copy photos from Mac/PC to iPhone. Backup iPhone music, videos, iBooks, iTunes files, etc. between iPhone and Mac. Create/edit/delete files; Remove iTunes purchases DRM protection; convert files. Compared with iPhoto, the latter Apple Photos has a big improvement on interface tidiness. Apple adopts the iOS look to the Photos for Mac to ditch away the previous iPhoto disorderly interface. The main interface of iPhoto has one button "All Events" at the top banner while the toolbar of Photos features four options: Photos, Shared, Albums and Projects, quite similar to the icons at the bottom of your iPhone iPad Photos app screen. So for iPhone iPad users, using Photos on Mac to manage photos is much easier than iPhoto, cuz the redesigned Photos interface they feel more familar than iPhoto. Apple encourages users to replace iPhoto with Photos partly because they bring more features and better organization system to Photos. The detailes are below. iPhoto: Four options are available for you to organize and search photos under "Library" section: Events, Photos, Faces and Places. The classification of photos is relatively simple. Thus sometimes it costs you a large amount of time to find out desired photos from tens of thousands of photos in Events. What's worse, some users complain a lot on forums that iPhoto doesn't recognize iPhone after iOS 11 update. Its performance seems a bit up and down. "Albums" button (similar to iPhoto Events) classifies your photos into different albums, including All Photos, Faces, My Photo Stream, Last Import, Videos, etc. "Projects" button is used to help create photos to Book, Card, Calendar, slideshow and you can even print them out for usage. At the left side of the main screen, click "Photos" under "Library" section and three options pop up at the top banner: Moments, Collections and Years. These funtions are self-explanatory, aimed to make it easier for you to find photos in large library. Other minor differences between iPhoto and Photos are also concerned by a slew of people like photo display size, photo viewing and sharing. iPhoto: to adjust the photo display size, the slide bar is located at the lower left corner of the interface. And to view photos in iPhoto, you need to double-click the photos to open it. As for the "Sharing" feature, it's usually ignored by most users, for it's placed at the non-conspicuous lower right corner. Photos: to solve the inconvenience of iPhoto, Photos uplifts the slide bar from the lower left corner to the upper left corner and add a "Play" icon next to the share button at the upper right corner. Thus, users adjust picture display size, view and share photos with much more convenience. In terms of interface and organization ability, you're recommended to update iPhoto to Photos without problems of iPhoto not working, importing stuck and more. I have tested both iPhoto and Photos on my iMac (2011 Middle) with 2.7GHz Intel Core i5 on Mac OS X Yosemite. The speed of Photo is obviously faster than iPhoto when it comes to photo browsing and iPhone photo to Mac transfer. Yet, though Photos is faster than iPhoto, its photo transferring speed is still unsatisfactory, especially for my 2300 4K photos. It costs me several hours to finish the whole transfer task (half crash sometimes). Is there any alternative to iPhoto or Photos to transfer iPhone photos to Mac at fastest speed? Yes, there is. 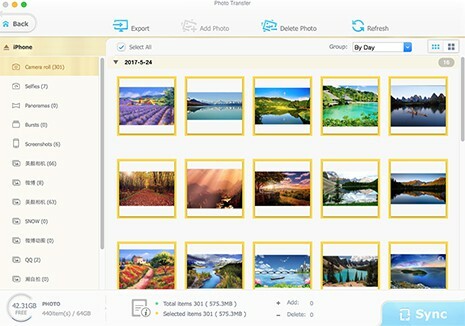 Have a try on the top Photos alternative - MacX MediaTrans, which can batch transfer photos from iPhone iPad to MacBook, iMac, Mac Mini, iMac Pro, etc. at No.1 fast speed (Intel QSV hardware acceleration tech supported). Bulk transfer photos from iPhone to Mac at world's No.1 fast speed, 30 seconds for 1000 4K photos transfer thanks to Intel Quick Sync Video tech. Also support you to 1 click transfer photos from Mac to iPhone iPad to use as iPhone X or iPhone 8 HD wallpapers. Delete unwanted iPhone iPad photos on macOS; make song iPhone ringtone; remove DRM protection from iTunes purchases; convert M4V to MP4, etc. Backup iPhone music, videos, ringtones, iBooks, audio books, podcast, iTunes purchases, etc. to Mac/PC and vice versa. Step 1: Free download this photo manager on Mac and then fire it up. Next, connect your iOS iPhone X/8/7/6s/6/SE/5s iOS 11/10 to Mac computer. Note: there will pop up a window to let you to properly set iTunes lest your iOS device data gets lost. Please follow the prompts to set iTunes first. Step 2: Tap "Photo" icon to get the photos from iPhone Camera Roll. Choose the photos you wanna transfer or just tick "Select All". Followed by a hit to "Export" button to begin transferring iPhone photos to MacBook Pro/Air, iMac, iMac Pro, etc. Note: You can select photos via photo albums like Camera Roll, Selfie, panorama, photo stream, etc. or via group, including Day, Month and Year. MacX MediaTrans, built-in with advanced Intel QSV hardware acceleration tech, can make your iPhone photo to Mac transfer at full speed, 1000 4K photos at 30 seconds. It also enables you to backup iPhone videos, music, movies, iTunes purchases, ringtone, iBooks, podcast, etc. between iPhone iPad and Mac/PC. A 100% all-rounded iPhone manager for your MacBook/iMac/Mac Mini. Apple Photos vs Google Photos: Which One is Better?